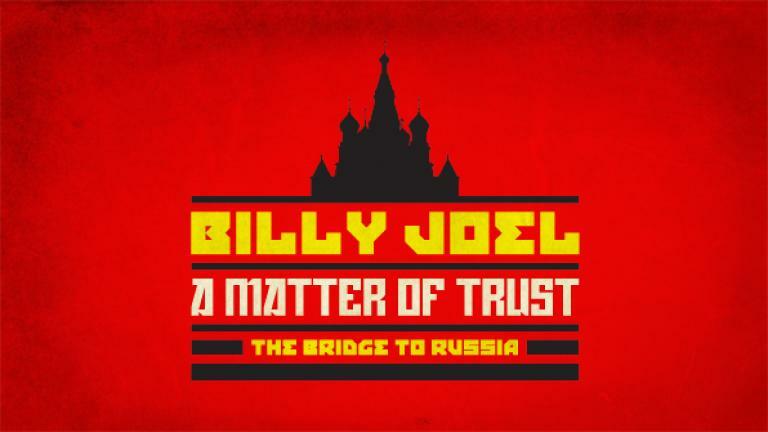 Columbia Records and Legacy Recordings, the catalog division of Sony Music Entertainment, will release Billy Joel's A MATTER OF TRUST–THE BRIDGE TO RUSSIA, the artist's historic 1987 Russian concert tour revisited on DVD/Blu-ray and CD, on Tuesday, May 20, 2014. A MATTER OF TRUST–THE BRIDGE TO RUSSIA will be available in a Deluxe Edition boxed set containing a full-length concert film (The Concert) on DVD or Blu-ray; a 2CD album (The Music) featuring previously unreleased tracks and bonus material; and, as an exclusive, the SHOWTIME® documentary film chronicling Billy's 1987 Soviet Tour, directed by four-time Emmy-winner Jim Brown (“Pete Seeger: The Power of Song,” “American Roots Music,” “An Evening with Henry Belafonte”). In addition, the Deluxe Edition comes with a book containing rare photos and new liner notes including first-hand accounts from writers and journalists who were there, among them Gary Graff, Michael Jensen, Neal Preston, Rona Elliot and Wayne Robins. A MATTER OF TRUST–THE BRIDGE TO RUSSIA: The Concert (DVD/Blu-ray) and The Music (2CDs) will be available individually, or inside the Deluxe Edition. A MATTER OF TRUST–THE BRIDGE TO RUSSIA: The Concert (DVD or Blu-ray) contains newly restored and remastered material from Live In Leningrad, 1987, a full-length concert film that has been unseen since its VHS release. For its DVD and Blu-ray debut, The Concert has been remastered from the original 35millimeter negative and expanded to include 12 previously unreleased performances, more than doubling the running time of the original release. 16. Back In The U.S.S.R.
A MATTER OF TRUST–THE BRIDGE TO RUSSIA: The Music (2 CDs) expands on 1987's original live ðÜohuept release, with 12 previously unreleased performances. 10. Back In The U.S.S.R. The CD, DVD/Blu-ray and Deluxe Editions of A MATTER OF TRUST–THE BRIDGE TO RUSSIA may be pre-ordered at Amazon (http://smarturl.it/bj_russia_amznCDDVD) and the Billy Joel Official Store (http://smarturl.it/bj_russia_officialD). A MATTER OF TRUST– THE BRIDGE TO RUSSIA: The Music (2CD) is available digitally on iTunes (http://smarturl.it/bj_russia_itunes). Earlier this year, Columbia Records and Legacy Recordings announced that all of the artist's studio albums had been newly Mastered For iTunes (itunes.com/BillyJoel) and would be available individually or as part of Billy Joel – The Complete Albums Collection, a specially priced bundle which includes a bonus anthology of 17 rarities. Throughout the 1970s and 1980s, Billy Joel was building a catalog of timeless songs while enjoying a string of consecutive hit albums and singles. Though selling out concerts around the world, Billy and his music were, like much of western pop culture and rock 'n' roll itself, unheard behind the Iron Curtain (except for black market bootlegs and faint shortwave radio). By the late 80s, The Cold War between the USSR and the West had begun to thaw in the light of Russian head-of-state Mikhail Gorbachev's policies of Glasnost and Perestroika, designed to bring openness and transparency to the Soviet Union while promoting political reform and cross-cultural exchanges. When the Kremlin invited Billy Joel to perform in the Soviet Union, he jumped at the chance to realize a long-time dream of performing for the Russian people. As America's pop rock musical ambassador, Billy Joel brought the Soviets their first fully staged high energy rock show. The tour began with a small acoustic concert in Tbilisi, followed by three electrifying stadium shows in Moscow and three shows in Leningrad. Billy Joel's historic visit to Russia became a worldwide news event, with journalists and writers covering the tour, its progress, and the effect Billy, his band and his family were having on the Russian people. The entire tour was professionally filmed and the concerts were simulcast on radio worldwide. During their stay, Billy and his family, along with musicians, staff, and a huge press entourage spent their days interacting with the Russian people, forging true bonds of friendship wherever they went. The tour been seen as a major cultural turning point in the course of US and Soviet relations. Seen and heard now, more than a quarter century later, Billy Joel's Russian concert tour performances stand out among the most electrifying and moving of his career. A MATTER OF TRUST–THE BRIDGE TO RUSSIA bears witness to the timeless revolutionary power of rock & roll. Having sold more that 150 million albums worldwide, Billy Joel is one of America's most popular recording artists and respected entertainers. A MATTER OF TRUST–BRIDGE TO RUSSIA arrives during a surge of activity for the artist, who's nearing his 50th anniversary as a professional musician. His enduring song catalog was featured in a tribute episode of “Glee” last November before the unprecedented announcement, in December, that Madison Square Garden would be making Billy Joel the venue's “first music franchise,” giving New York audiences an opportunity to catch a local hero and American musical legend performing an ongoing artistic residency at the Garden. On December 8, 2013, Billy Joel was awarded the Kennedy Center Honors, given to members of the performing arts community for lifetime contributions to American culture.